Gladiator Finals Pictures #1 – Redpoint Round by Keith North + Results!!! We were excited to use many of the hold review holds along with our normal arsenal in setting the 4o redpoint and 2 open finals problems for the Gladiator Finals. If there is a hold company mentioned in the photo caption of the pictures below, then clicking on the photo will take you to the company’s site where you will be able to check out the rest of their line and see what they’re all about. Cool? Cool! Click HERE for The Spot Gladiator Finals page, HERE for adult results, and HERE for youth results. For Open Finals results check out THIS POST from earlier in the week. Check in tomorrow for Finals photos and hopefully some video. Thanks Keith for all the great photos!!! Coming soon — Battle in the Bubble! 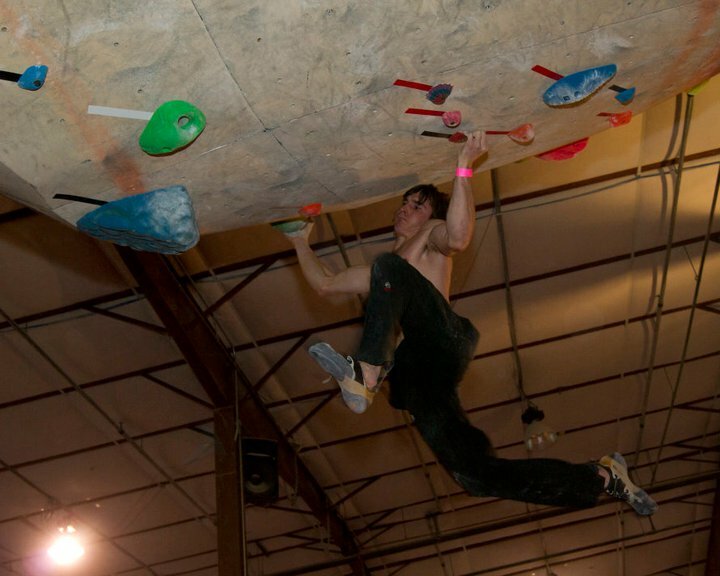 The Spot Bouldering Gym is proud to announce Boulder’s first outdoor pro invitational!!! 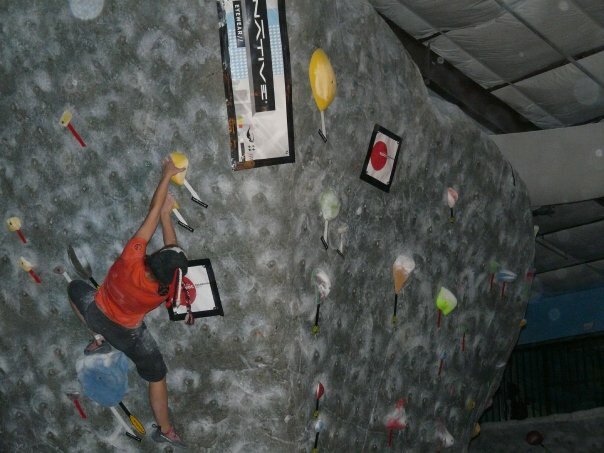 The Highball Highline comp last night was amazing! 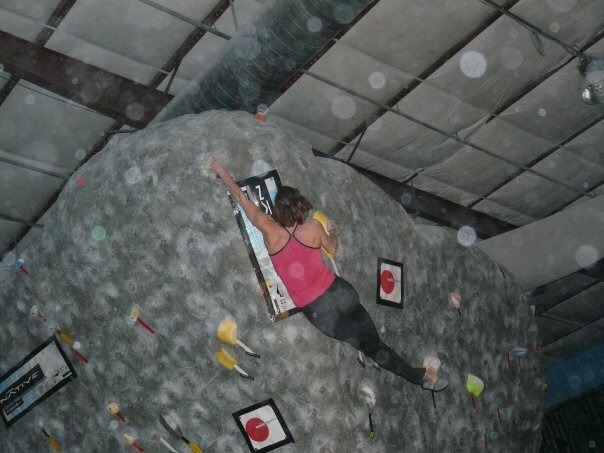 The weather here in Boulder lately has been unfriendly for climbing outside (to say the least–snow and 0* temps anyone?) and the result was a huge crowd at this ABS sanctioned comp. 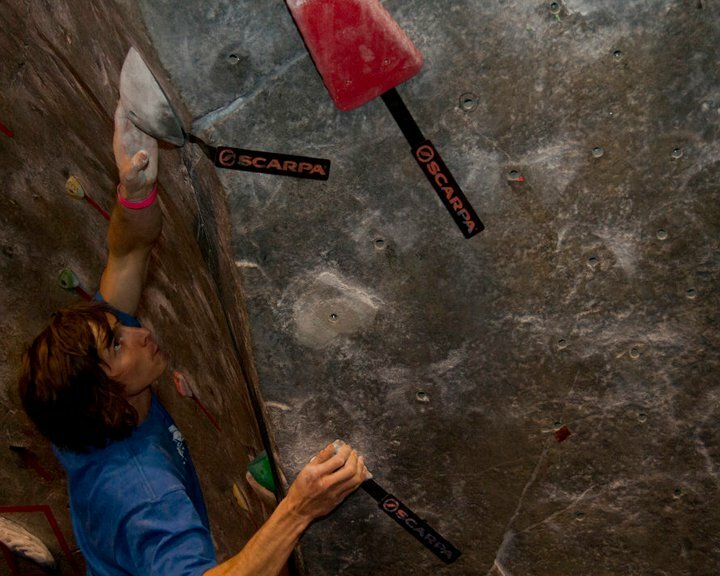 All in all over 300 climbers came to test their mettle on the 50 new boulder problems. 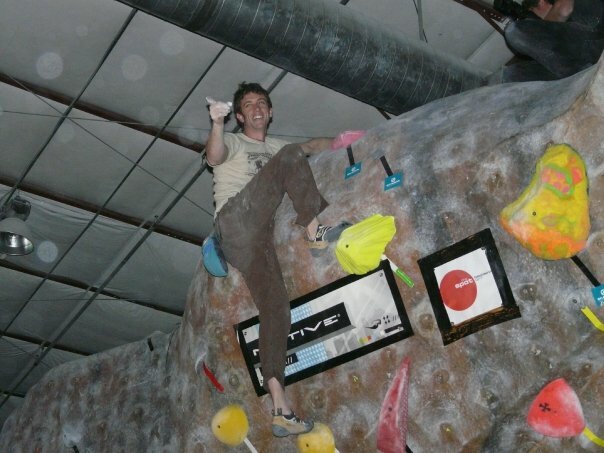 As usual, the crowd consumed a massive amount of fish tacos in record time, and the Avery kegs were flowing for spectators as DJ Dirt Monkey kept the climbers crushing. Of the setters, Jonny, Carlo, Jon, Alex Puccio (guest setter), Nick Sherman (long time Spot comp setter) and I were in attendance for most of the evening. Because the Spot comps have a single final problem for men’s and women’s open, the setters watch the regular comp to try to see who might make finals and how they’re climbing. From this we decide if we need to tweak the finals problems to make them more or less difficult. At eight pm scorecards for the adult session were called in and the highline was quickly set up. On Friday while we were setting Josh Paton (our facilities and safety manager), Adam Broadbent (climbing school) and the slackliners set up the padding and anchor points and tested the leash length and line tightness so it would be ready to go as soon as climbing ended. 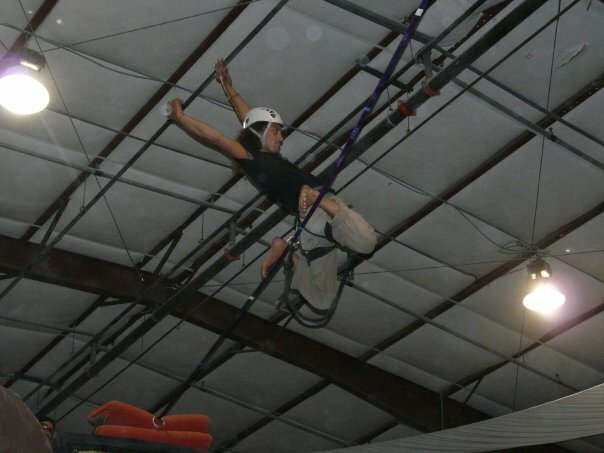 They also padded the heating duct and taped an “ariel zone” on the line so slackliners wouldn’t get too close to the boulders or hit the duct while doing in-air tricks. The preparation was worthwhile, and the line was ready to go by 8:30 or so. While they were setting the line up Alex and I tweaked up our women’s problem and Carlo, Jonny, Nick and Jon tweaked up the men’s. There was a great debate amongst the crew about whether the women’s would be hard enough, but because the holds were big slopey pinches and the moves were powerful we decided the problem would be okay if we just turned a couple of holds up (i.e. made them harder to hold) and changed out a big pinch at the top for a more precise crimp. We figured the problem should be about 4 Spot +, as the climbers would be tired and two comps ago the 4 Spot + final was about the right grade. The female finalists were: Chauncenia Cox, Gabi Masse, Tyler Youngwerth, Kristin Felix, Audrey Gawrych, Alexis Miller, and Kara Caputo. The men’s problem was also tweaked up a little, and the male finalists were: Paul Robinson, Adam Markert, Gabor Szekely, Ryan Roden, Andre DiFelice, Sebastian Drissi, and Matt Wilder. This year the ante was upped considerably, with most of the walkers being semi-professional slackliners who are well versed in tricks. Adam started the evening off by testing the line and taking a few leash whippers. From there, one by one, the slackliners got a few minutes on the line to show their stuff. Some seemed hindered by the leash, but all managed a few cool tricks, including Said Parirokh’s jump to the I beam, Michael Payton’s bounce and balance tricks, and a pressed out handstand from Jeremy Louis. 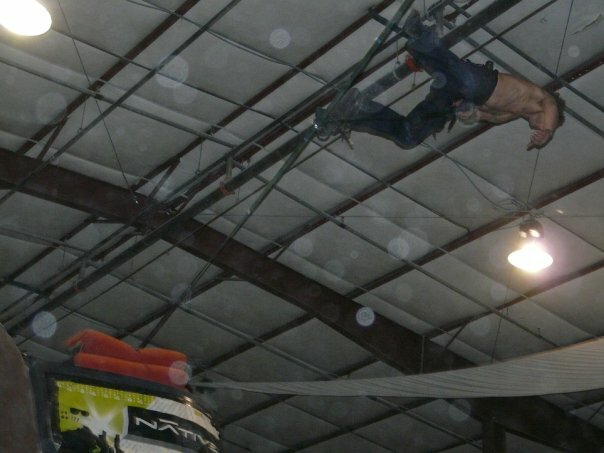 Several of the guys tried to land both front and back flips, with a few pretty amazing whippers resulting. Expect video to start showing up on the internet today and tomorrow. The highlight of the evening was when Andy Lewis, a noted slackliner from Humbolt, California, got on the line to finish things off. 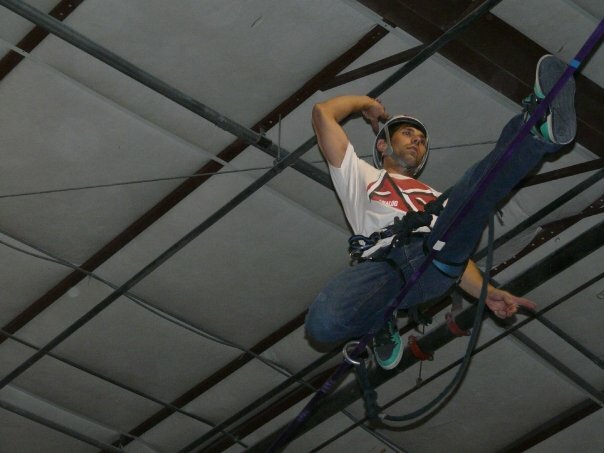 Andy came out and immediately did an ariel 360, much to the crowd’s delight. From there he did several other cool tricks, throwing t-shirts and stickers as he went. It seemed he’d already won the comp when he did his final trick, a backflip that he LANDED ON THE LINE!!! The crowd went completely nuts. Completely. Nuts. 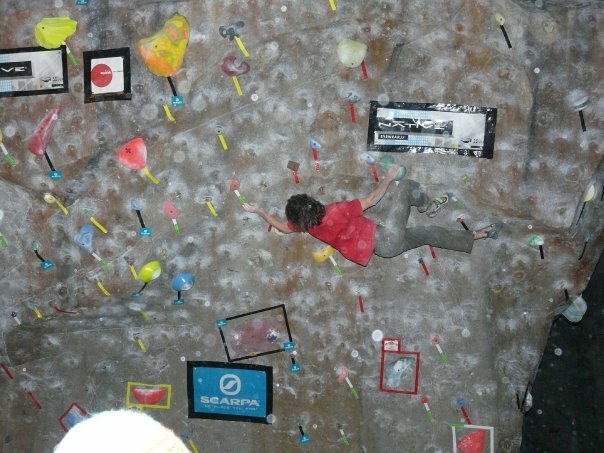 He finished off the evening by doing a bouncing swan dive straight over the crowd (as seen above), swinging dramatically back around and grazing the gigantic Spot Bouldering Series banner that hangs in the center of the gym before grabbing back onto the line and mantling back up so he could exit the line via the top of the Font boulder. It was pretty incredible to watch, and everyone in the crowd was extremely psyched. update: more videos are showing up on facebook, including This one by Zack Smith of Andy’s crowd dive. update 2: Here is a video of Andy doing his first ever highline backflip a few years ago. When he did it he was the first known person in the entire world to ever land the trick. Though he has done backflips on low lines in the interim, he didn’t land the highline backflip again until Saturday, Dec 5, during the highline contest at the Spot. Click here for more on slacklining. 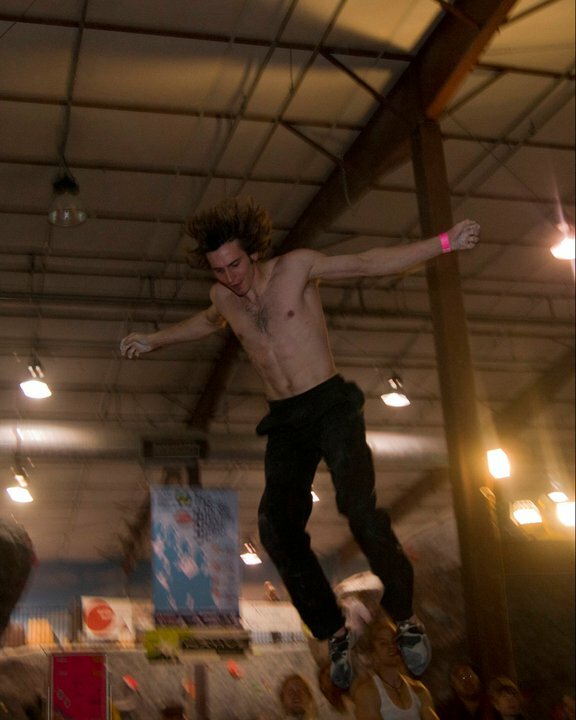 The slackline was quickly dropped and lights were put into place for the Open finals. The men’s proceeded well, with the first few competitors falling all over the place. 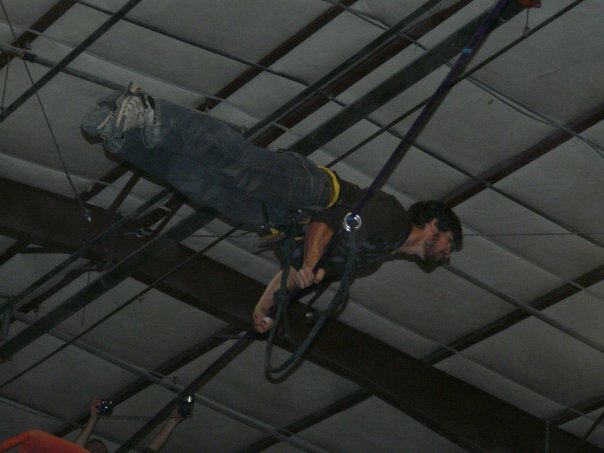 On his turn Andre Difelice established a new high point, then fell off on a dramatic attempt to dyno to the top. Ryan Roden met the same fate, but Gabor Szekely dispatched the problem handily. Adam Markert cruised as well, going so far as to stop and dance on the last hold before casually mantling over the top. 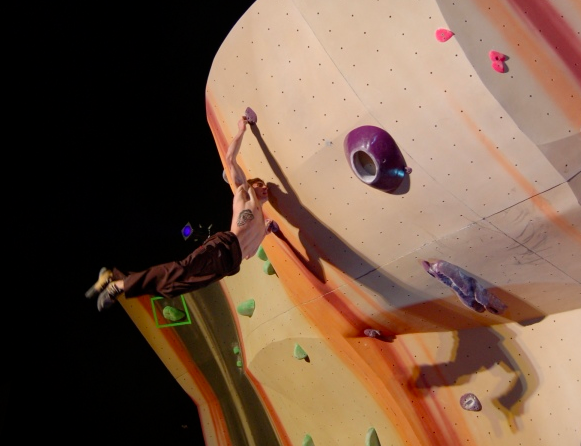 Paul qualified in first, so he climbed last, and he flashed the problem easily–winning the comp. The first woman out, Kara Caputo, hiked her final and Alex and I were thrown into a panic. Kara is a very strong climber, but she made the pinches look like such jugs that we were sure everyone else would hike it as well. We were mostly right, though the two shortest competitors (Kristen Felix and Tyler Youngwerth) met some difficulty with a hop move on the top of the arete. 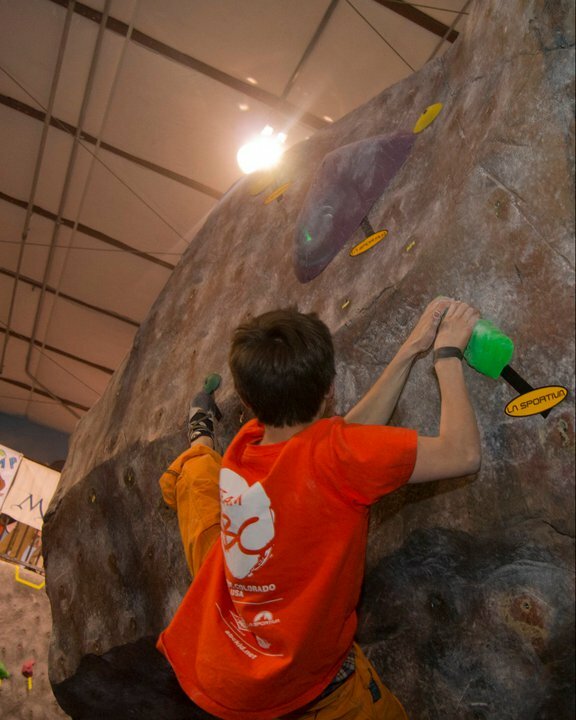 We were assured by all the competitors that the problem was very enjoyable to climb, which was nice, but overall the problem was still a failure, as it was too easy for the competitors and not exciting for the crowd. We learned from the experience, mostly that the girls are much stronger than they used to be, and they’re still capable of pulling hard after 3 hours of climbing, and we need to challenge them much better next time. Unfortunately we had to count back to qualifiers for the finals results. Despite the finals problems not being ideal, overall I think the comp went well. 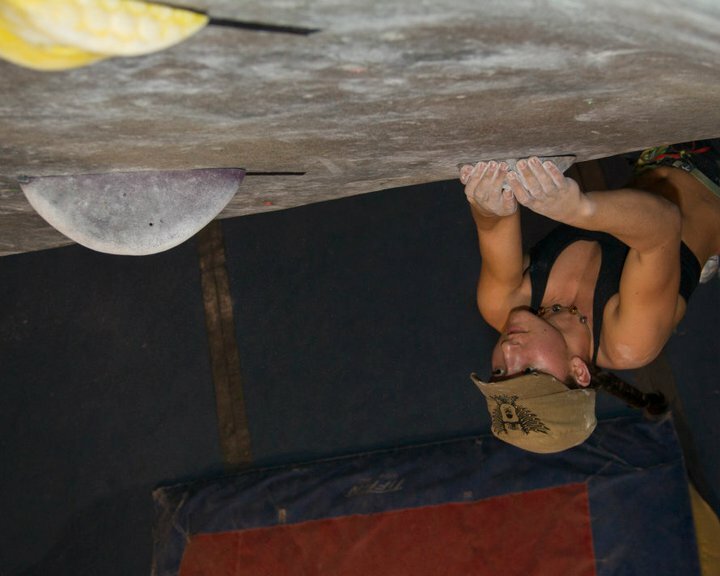 Several of the women finalists were able to complete several Open category problems in the main comp–an improvement from their normal performance. Also, because Alex set instead of competing, the women’s finals was anybody’s game and therefore should have been more exciting. For the men, we made the hardest Open category climbs all around the same grade to encourage the climbers to battle it out instead of deciding O10 was impossible and knowing they made finals so not bothering to climb it. 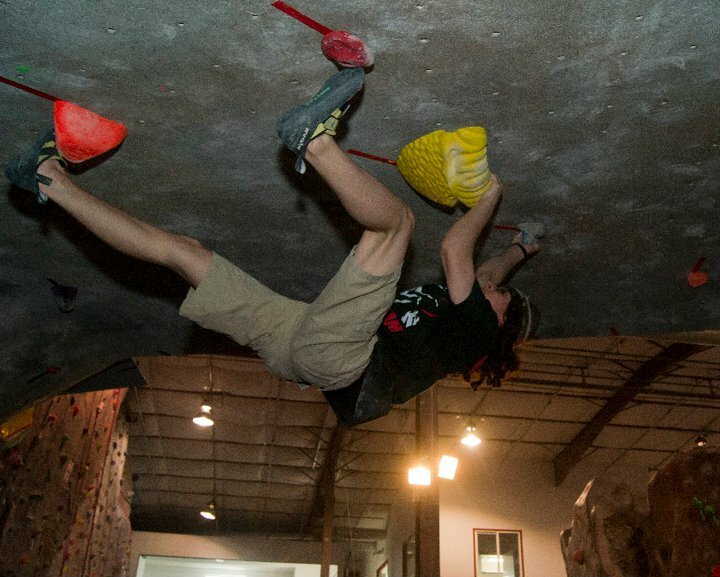 This time everyone had to try to send the top O problems to earn a spot in finals. Part of the reason setters come to comps, despite their exhaustion from the long nights of setting, is to watch their problems get climbed and try to learn from them. I particularly enjoy watching the kids climb because it’s always interesting to see what move you think will be easy for kids that they just cannot reach through, and which moves you think will be impossible for kids that they will figure out a way to get through. Our goal is to make the problems doable for all sizes, but you can’t set every problem, especially in the advanced and open categories, for people of extremely diminutive stature. I heard from some that the kids in the youth session found the problems reachy. I’m not sure about this, as I spent part of the evening with Brooke Raboutou, who climbed in the adult session as she had a gymnastics meet earlier in the day. Brooke is 8, and small for her age, but she is an extremely talented climber, and though some of the problems were too reachy for her she managed to climb more in the advanced category then she ever has before. Sasha, a Spot youth team member who is bigger than Brooke but still much smaller than the adults, managed to climb extremely well, sending most of the problems up to A8. Robyn Erbesfield-Raboutou, who is also relatively small, climbed during the adult session and said that she did not find the problems to be particularly reachy. I suppose the jump starts on two of the A problems probably gave some folks trouble, but besides that it should have been fairly equal opportunity. If you came to the comp and felt that a problem or a part of a problem was reachy, or cruxy in some other specific way, and you want to tell us about it please email us (setting@thespotgym.com) or add a comment telling us specifically what and where so we will be able to look at the problems and have an idea how we could make them better next time. We always strive for excellence, after all. Excellence and fun. Highball highline Comp Almost Ready!!! We’ve been hard at work for the past two days and I’m happy to say that we’ve almost got all the problems up for the comp tomorrow. Of course, we still have to clean up the floor and forerun, but things are coming along. Perhaps more exciting news–the highline guys have the line set up for practice and are testing tricks, taking huge whippers, and making sure the line is safe. A few slackliners even travelled here from Europe to walk the line!!! Back to setting news, we have several new DRCC holds to check out as well as the Climb-its we got last month. Come and see us tomorrow–it’s sure to be a good time! We also got really cool new holds from DRCC, a company that I’m excited about for their great shapes, awesome marbling colors and super slick duel-tex. You can check them out on the front and right side of the Font boulder. I hope you enjoy climbing on them. Finally, I would like to get some feedback form you guys! What would you like to see on this blog? What would you like to see in the gym(setting related)? The Routes? From the Setters? Please Please leave a comment!!! We put many of the awesome new Climb it holds to work this week, with new problems on the back and small scoop of the Hueco, the entire River Granite wall, and the right side of the Font boulder. Carlo is out of town so there were only four of us on Tuesday and three on Wednesday, but we still managed to set 35 new problems for your climbing pleasure. Enjoy! We also have a new hold washer, Jeff Lambert. If you are interested in washing holds for a trade membership (1 month of membership for every 6 hours of work) shoot us an email or get in touch on our facebook page.